Around the world, public opinion is divided about whether government-sponsored torture can ever be justified as part of efforts to prevent terrorist attacks, according to a spring 2015 Pew Research Center survey of 38 nations. A median of 45% across the countries polled said they did not believe use of torture by their governments against suspected terrorists to try to gain information about possible attacks in their country could be justified. A median of 40% thought the use of torture could be justified in such cases. Looking at public opinion across major regions, the view that torture may be justified is most common in sub-Saharan Africa, where a median of 55% hold this view; it is least common in Latin America (a median of 25%). The U.S. public is among the most likely to consider torture justifiable: 58% say this, while only 37% disagree. There are only five nations in the survey where larger shares of the public believe torture against suspected terrorists can be justified: Uganda (78%), Lebanon (72%), Israel (62%), Kenya (62%) and Nigeria (61%). American public opinion breaks sharply along partisan and ideological lines on this issue. Nearly three-in-four Republicans (73%) think torture can be justified against people suspected of terrorism, compared with just 58% of independents and 46% of Democrats. Similarly, 69% of conservatives say it can be justified, while 59% of moderates and 43% of liberals agree. Ideological divisions on this issue are not unique to the U.S. 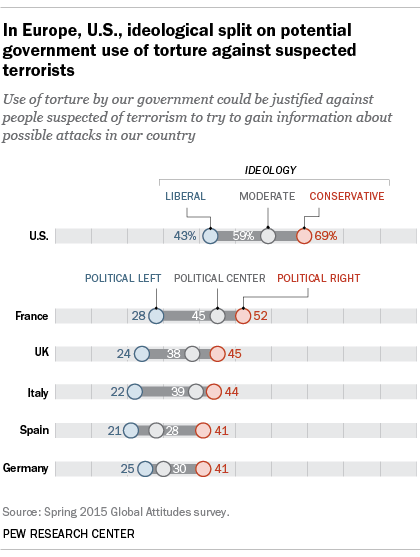 In all five Western European nations surveyed, people on the political right are more likely than those on the left to believe their government could be justified in using torture. People’s views about their own country’s potential use of torture are strongly correlated with their views about the U.S. government’s post-9/11 interrogation practices. 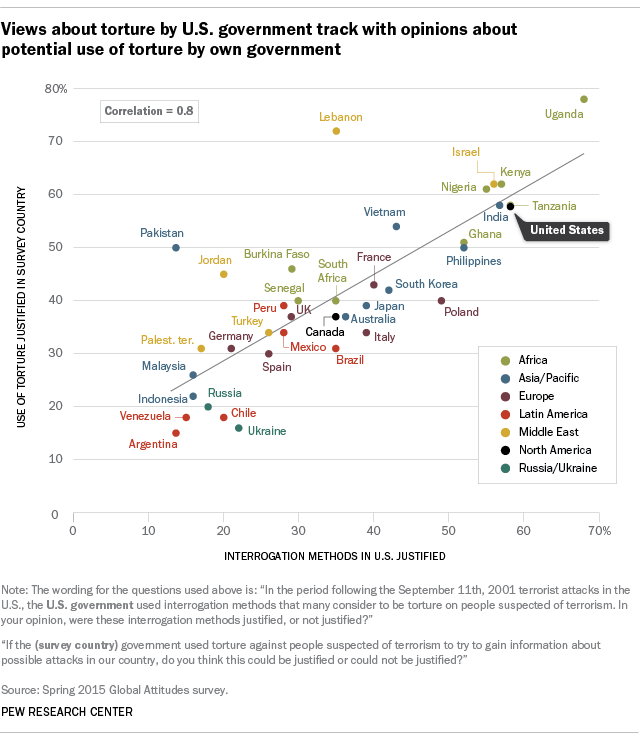 Countries with larger percentages of people who say their own governments would be justified in torturing terrorist suspects also tend to have larger percentages of people saying the use of torture by the U.S. government was justified after the 9/11 attacks.